You know, I've been looking at everyone's posts - and I need a picture of myself when I was not overweight. Here's the crazy part - I have them BUT it was before the digital picture world even existed. I'd have to scan them in its so long ago!!! How sad! When I got married, 15 yrs ago, I weighed about 170. I reached my highest weight after my son was born, 8 yrs ago, lost weight, got in shape and down to about 200 when I got pg with my daughter. I worked out the entire time and only gained 20lbs. Then slowly, I gained 25 lbs from being lazy and not working out anymore or eating right which puts me right about HERE! In all my skinny pictures, I have REALLY big hair! LOL. I think that would overshadow all my skinny-ness, you guys wouldn't be able to get past all the hair to see my svelte self! I'm going to have to break down and scan some at work next week when I get back in the office..... P.S. 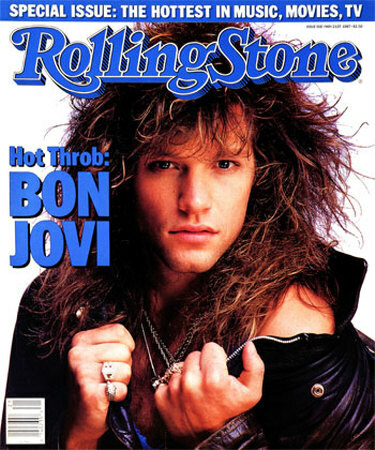 My hair was eerily similar to Jon Bon Jovi's - as in THIS picture! ahhhhhhhh! LOL Were you a child of the eighties? I have pics of me too back then (When MOTH and I were soooo young!!) and I also had big hair. The bigger the better. Oh Jon how I adore thee big boy! My skinny pictures all predate digital cameras as well as I would have to go back to the junior high! So I made it back to exercise and gained? What?